Just say those words again…Maple Bourbon Candied Bacon…now pinch yourself. It’s real, this is really a thing! Cooks Well With Others takes Candied Bacon to a whole new level of deliciousness by adding maple syrup and bourbon. 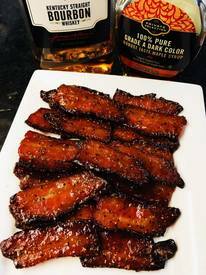 This thick cut Maple Bourbon Candied Bacon is so addicting!